Sometimes a short staycation is just what the doctor ordered. Literally. 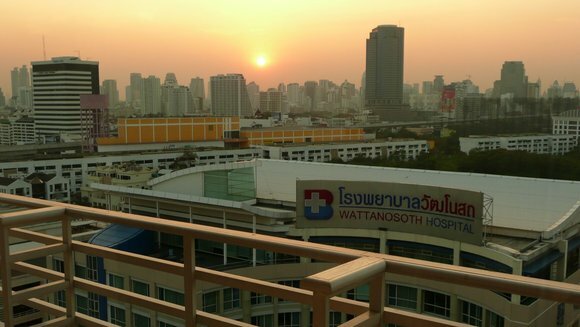 On my return to the doctor, much as I expected, there wasn’t any significant improvement with my lung infection so I’m doing two to three at Bangkok Hospital. Thankfully, I bought expat insurance a year ago which covers hospitalization expenses at a pretty generous level. Didn’t think I’d have the need for it anytime soon but there you go… better to be prepared. While this blog serves primarily as a means to keep my friends and family up to date on what’s going on in my grand adventure in Thailand, I’ve been fortunate to receive so many other visitors. To those of you who are here, who have stayed, and who actively participate in the conversations, thank you! Having never been hospitalized before, I was eager to have a new experience to blog about. So far all I can say is, it’s tedious! Today was a public holiday so Tawn was with me part of the day before returning home to run some errands and subsequently stubbed his small toe, getting a hairline fracture in the process. When he returned to the hospital he visited another doctor to receive treatment. The plum purple toe is slowly losing its swell and hopefully he’ll be back in easy walking condition soon. So now we’re both ailing! As for me, I had to deal with a ongoing problem I have – elusive veins. After poking around several times and not finding an active vein into which to run the IV line, a very sweet and apologetic nurse handed me off to someone else, who was able to strike oil on the first try. Labels and stickers are on so I’m now officially the property of Bangkok Hospital. Apologies for the Sharon Stone-esque shot. The nurse did not cross her legs. The “deluxe” rooms that the insurance covers were fully booked so they moved us to a “superior” room at no additional cost. No kidding, this place is nearly as large as our condo! I have an amazing view of the city and enjoyed a fantastic sunset. Fruit plate for dessert, a clear soup with dark leafy greens and braised beef, ground pork with broccoli (which needed some fish sauce added for flavor) and a fried white fish with onions, green onions, carrots and cilantro in a sweet and sour sauce. Huge amount of food and actually, not too bad! A quick observation: I’ve been on an IV nonstop, a litre of saline slow dripping into my arm with injections every eight hours of this liquid antibiotic. When they plunger it into my veins, I can feel it making its way up my arm, relatively cool (I guess they refrigerate it) and like an extra wave of blood heading for the heart. Not painful but a very unique sensation. Anyhow, I’m here for at least a few days. No excuse not to stay on top of my blogging, I guess, as I have plenty of free time. Ciao. This entry was posted in Uncategorized and tagged Hospital, Illness by christao408. Bookmark the permalink. If they had food like that here, I wouldn’t mind being hospitalized! hehe. Why is it they always let the ones that need practice inserting IV catheters have a go at you first?? Next time tell them up front – “I have really difficult veins to hit. Send in your best vampire.” That way you won’t get the one that needs to practice. You’ve got to be kidding me.When’s the house-warming? Hope you recover from your infection soon; but wow the food does look more appetizing than what’s provided in US hospitals. I have the same issues with difficult veins. I hear you with the tricky veins. It took them four tries to get one started when I was in labor… even after I warned them. I’m jealous of the pretty decent-looking meal and the view! I hope you’re feeling better! That sure is a nice room!And a nice meal too! You have to pay extra though?Sharon Stone!! !Get well soon! You are such a dedicated blogger. Thanks for keeping my procrastination inner vehicle continually fueled and constantly entertained. You’re so awesome. Wishing you a speedy recovery. I have to say, having being hospitalized a couple of times in the U.S., that your hospital looks like the Four Seasons Hotel by comparison to the “motels” I’ve had to spend the night at! I also assume the staff is less hurried and overstretched vs. the U.S.!Ah … the elusive veins … just like mine. Get well soon. Wow, that’s a really nice hospital room and some impressive hospital food o.OI think that place is nicer than a lot of places I’ve lived, even.Hope you get well soon, but at least your stay is going to be a comfortable one haha. Haha. Are you sure you are sick?! I have been to the hospital so many times before; so it lacks the excitement now. But, man- if I am in Bangkok, I think I will pretend sick and check myself into the hospital instead of staying in some small hotel. I’ve seen an IV sticking out of a patient’s forehead once because there were no other veins haha.And nurses in Thailand wear short skirts? haha nice! was she pretty too? That’s a hospital? Oh wow, the view is better than my condo and I think it might even be bigger. With the kitchen, you can continue your cooking blogs. I gotta hand it to you, blogging from a hospital. 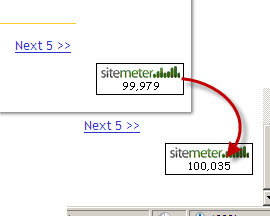 That’s gotta earn you big points somewhere in blog heaven. When I was a kid, they used a vein in my foot (near my toes)for IV. All the other veins in my arms were hiding from the nurse. Get well soon Chris. Nice looking meal. I’m impressed. The question you have not addressed however: How are you feeling? Usually a hospital stay means you are pretty sick. Get better soon. no wonder lots of my friends in HKG love to check into the hospital in BKK for annual check up…..for sure you will be well treated in those places….anyway get weel soon! Oh my god was she just poking through your skin looking for it. Sounds painful. And the food looks like a treat. The hospital food here reminds me of crappy airline meals. Thank you everyone for your wishes for a speedy recovery. I’ll write more about my progress and experiences in the next day or two. For the moment, suffice it to say that IV antibiotics are powerful medicine and they’re battling with a pretty stubborn lung infection, so my temperature has risen and fallen a lot over the last 26 hours. At the moment, it looks like a few more days but we’ll see how things progress. @Wangium – Yeah, what can I do? All the lotions here in Thailand are whitening lotions! LOL@Rm2046 – @murisopsis – Thankfully, despite the multiple times being poked, it really didn’t hurt much and the nurse was super apologetic. @CurryPuffy – Like many hospitals here, there is a large part of the operation focused on foreign clients and medical tourism. 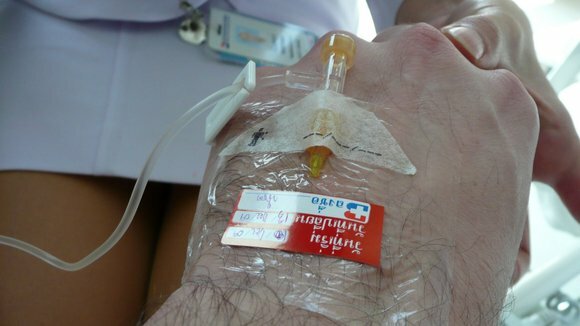 Those undoubtedly subsidise the Thai patient operations. Had I not had insurance, I would have gone for something more at the Thai end of the scale. As it is, everyone is speaking to me almost exclusively in Thai. Leading to some interesting misunderstandings. @Redlegsix – @marc11864 – Party is for Monday. Can you make it? =)@agmhkg – BKK gets medical tourists from all over the world. It is, truly, very good value for the money. Special going on until the end of the month: heart bypass for 500,000 Baht – about US$13,000 all-inclusive. Really, that isn’t bad. @stebow – The lung infection is stubborn so will take at least a few days to overcome. For the most part, I’m feeling fine, though. @ElusiveWords – Well, the internet is the savior for those who can’t sit quietly and do nothing, right? Which, if I really had to, I suppose I could do. @MAXIMO – Wow, out the forehead? As for the nurses, they are actually very pretty and very nice. When you come to Thailand, I’m sure you can meet a nice girl if you check into the hospital. Let them know you have a US passport and I’m SURE you’ll go home with a wife. =D@LostSock21 – Thank you@Dezinerdreams – That might be overkill, Vivek. I can just recommend an affordable and nice hotel. =)@choyshinglin – I read that entry before I checked in, actually, curious to read what your experience was like as preparation for my own. @arenadi – Which is either a comment on the hospital or on the places you’ve lived in… which is it? @TheLatinObserver – About the staffing, it is hard to say. While I haven’t observed any short-staffing, I’m also being treated in a section geared to expats and foreigners. Since we (or our insurance companies) are paying higher rates, I’m sure staffing is adjusted to meet expectations. It may be different in other wards. @XXKimPossibleXX – I’ll accept the “dedicated” label but really, I just find blogging more interesting than facebook. 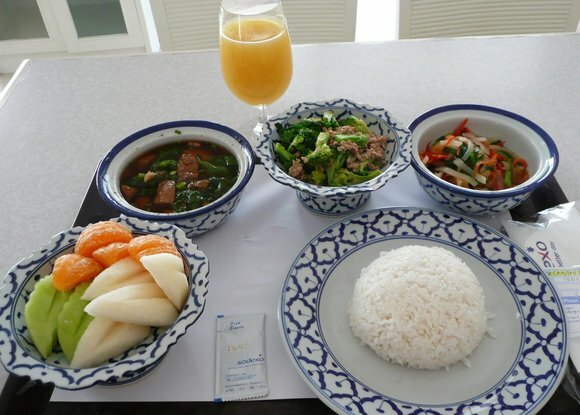 @yang1815 – Meal and room are separate costs. If I was really pinching pennies, I could have people bring food in to me, which is the norm I suspect in many hospitals geared towards Thais. @alextebow – The view really is quite good. Now if they would just unlock the door and let me go out on the balcony. @waiszeblogs – It seems like lots of us have the vein issues. I bet they are there all the time but then just when you need to stick them, they sink beneath the surface! @Redlegsix – Okay, but don’t say I didn’t offer! @christao408 – So if you order from outside, do those meals fulfill the nutrition requirement some patients may have? 1.Sorry to hear that both you and Tawn are ailing. When it rains, it pours, I guess!2. I definitely did not notice the nurse in the picture until you pointed it out! Oh my.3. The hospital food actually looks pretty good (I never thought that statement would come out of my mouth or rather my fingers as it were)4. A few days stay? Have the doctors made any more determination of what’s wrong? @christao408 – I agree that blogging is more interesting than facebook. It seems that a lot of people I know have branched off and created their own blog site & so I have a ton of fave blogs saved under my favorites. @christao408 – It’s both, actually haha. In fact, if that wasn’t a hospital room, I wouldn’t mind living there. I am sooo releieved that you are in the hospital and on IV abx. ANY INFECTION in the lung, is pneumonia Chris. There are different types and I am hoping that it is a simple one, from the way you have responded to the abx. Your room looks like the ones they have for ropyalty at the Mayo clinic here. Feel good and BE GOOD.Muah. That food looks delicious. I’m in college and Sodexo does our food too, except it’s gross. @yang1815 – In this case, I’m not being put on any dietary restrictions. I would guess, though, that no they don’t count. @TheCheshireGrins – Bacterial infection in the left lung. The doctor has never specifically determined it to be pneumonia but seems to be in roughly the same category although maybe not as severe. @XXKimPossibleXX – I recently learned about Google Reader, a service that provides a single place to read all the updates to various sites you want to follow. A lot of blogging sites don’t offer a handy subscription service, from what I’ve seen, so I’m migrating all of them to Reader so one as to have a one-stop shop for keeping up with everyone. @christao408 – oh how cool. thanks for the info, i’ll look into it. that’s really why i liked xanga so much in the first place. it was a one-stop shop to read different blogs via a subscription but my faves don’t blog anymore, thank goodness you still do.